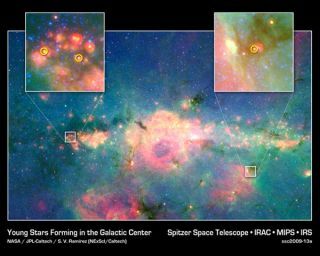 The yellow circles show the young stars that were detected in the chaotic environment at the Milky Way's center. PASADENA, CALIF. ? Baby stars have at last beenfound in the harsh environment at the center of the Milky Way, astronomers saidhere this week at the 214th meeting of the American Astronomical Society. These are"stars that have just ignited their core and they are just starting toproduce light. So it is a very early phase in the star formation process,"said team member Solange Ramirez of NASA's Exoplanet Science Institute atCaltech. The heartof our galaxy is an extreme environment, with fierce stellar winds, shock wavesand a core supermassiveblack hole all packed into a region 600 light-years across. While this isbut a fraction of the total diameter of the galaxy, which is 100,000light-years across, the core is stuffed with 10 percent of the gas in thegalaxy and a bounty of stars. Astronomershave long known that stars are born in this chaotic environment, as evidencedby clusters of massive adolescent stars and clouds of charged gas ? a sign thatnew stars are beginningto ignite. But howthey could survive in the region of intense radiation and tremendousgravitational interactions remains something of a mystery, and directobservations of newborn stars have been complicated by the dust that enshroudsthem. "Thesestars are like needles in a haystack," Ramirez said. "There's no wayto find them using optical light, because dust gets in the way." To getaround the obscuring fields of dust, astronomers used NASA's SpitzerSpace Telescope. Ramirez andher colleagues scanned Spitzer mosaics of the galactic center, focusing in onmore than 100 candidates of so-called young stellar objects. Viewed from faraway, these stars can look much older than their actual age because both typesof stars are dusty. "Theold stars and the young stars look pretty much alike," Ramirez said. "You cannot tell them apart." Examiningthe light signatures of each star can distinguish between baby and elderlystars. Clouds of certain warm, dense gases are one signature of young stars,for example. The starsare "still embedded in the molecular cloud where they are beingborn," Ramirez said. The threeyoung stellar objects found by Spitzer in the heart of the galaxy are all lessthan about one million years old (our sun is 4.6 billion years old andconsidered middle-aged). They are all shrouded in these clouds of gas and dust,which will supposedly eventually flatten into disks and could form planets. The teamplans to look for more baby stars in the galactic center in the future, whichcould shed light on how these stars manage to form in the intense environmentat the heart of the Milky Way. "Bystudying individual stars in the galactic center, we can better understand howstars are formed in different interstellar environments," said team memberDeokkeun An, also of Caltech.